Downloadable, high-res Market Insights™ graphics and webinar summarize 2015 developments, 2016 predictions in Global Services market. The maturing global services industry experienced continued growth in 2015, with location activity reaching an all-time high. The drivers of that growth, however, have evolved. Small and mid-sized buyers led growth across industry verticals, and the adoption of new technologies caused disruption in the market, according to Everest Group, a consulting and research firm focused on strategic IT, business services and sourcing. Looking ahead to 2016, Everest Group predicts service delivery automation (SDA) will become a priority for Global In-house Centers (GICs), often called Shared Services or Captives, and will impact the location portfolio in a variety of ways, including a rise in both consolidation and reshoring, the latter especially in situations where speed-to-market is important. These research findings are summarized in a set of high-resolution graphics available for complimentary download here. 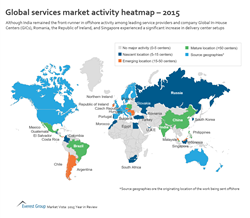 These Market Insights™ illustrate key takeaways from Everest Group research on the developments that took place in the global services industry in 2015. The graphics may be included in news coverage, with attribution to Everest Group. The research supporting these Market Insights graphics was discussed in a webinar conducted by Everest Group last month. Listen to a recording of “Market Vista™ | Global Services Developments: 2015 Trends & 2016 Predictions” or get the presentation here.